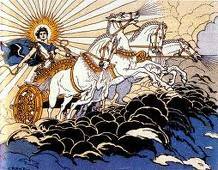 Every morning Phoebus Apollo hitches his horses, sons of the wind, to the chariot of the sun, and hurtles upwards across the sky, dropping back to earth at night. Horses have to eat, after all. You can’t see this performance, for the sun’s brilliance blinds you, but how else do you think it rises every day? If you believe your eyes you come to the less fantastic conclusion that the sun simply orbits the earth, though you rapidly run into facts that restore the fantasy element. Planetary paths look like those of whirling dervishes, and the phases of the moon are, well, moonshine. You end up having to invent gods who behave like spoilt brats, or one God whose mind is unfathomable. Only years of observation enable you to predict more or less where planets will end up, for theory alone doesn’t. An egocentric, or geocentric, vision is a distorted one. It was Copernicus who, by putting the sun in the centre, simplified the mystery and the mathematics; Galileo who nearly became astronomy’s first martyr, but saved his life by lying; Newton who with his laws of gravity and motion made sense of the orbits. A lot of others contributed, too, to produce the picture, so elegantly simple that its truth now seems intuitively obvious, presented in any child’s atlas. Revolutions don’t happen overnight, nor, usually, are they the products of single flashes of genius, but rather a dawning illumination punctuated by periods of chasing will-o-the-wisps. This revolution in psychological as well as scientific thought has its humbler parallel in contemporary horsemanship. Traditionally our view of the horse has been typically egocentric: God gave man dominion over the animals, horses are there to serve us, teach them who’s master. Unfortunately God forgot to tell them and they’re hard to convince: they skitter around like whirling dervishes and are apt to moonshine, though years of experience enables you to predict some of their lunacy. Evolutionary ethology gives us a picture of Copernican clarity. Horse behaviour does not revolve around us, but around survival and breeding in the wild, where they avoid being caught and live together as harmoniously as possible. They like to repeat pleasant experiences and avoid unpleasant ones, and since they are quick learners we can train them. The closer we keep to their evolutionary expectations the easier this is: animals that constantly want to be somewhere else don’t learn easily. Hence round pen training, in which we leave the horse loose, use his natural comprehension of body language, and allow him to lose his apprehension in his own time until curiosity takes over, is, or can be, very much faster and easier than other forms, with a few provisos. (One is that we remember that a good deal of training is about strengthening, supplying and balancing, which always takes time.) Fortunately there isn’t an equestrian Inquisition, or like Giordano Bruno, I should have been burnt: here in Spain, with its history of savage authoritarianism not so long ended, round pen training looks like witchcraft and druggery. But even in countries with a decent history of democracy the weight of human interests bears heavy. We like to be in control, and to have material means of ensuring it. And relinquishing egocentric attitudes doesn’t come easily. This is reflected in two ways, the first practical. “Natural” training methods can produce results so spectacular as to be an exhibitionist’s delight. It is not difficult to render the horse completely passive and, in order to impress, work him to the point where he is no longer actively cooperating and learning but passively allowing himself to be pushed about. This satisfies some, but increasingly those with a critical eye see a dullness, a lack of interest, in horses whose imprint, Parelli or round pen training has been overdone. In any kind of training, one of the most difficult sensibilities to acquire is that of knowing when to stop. The second way is deeper, conceptual. In the astronomical revolution, an interesting reluctance to accept that we are not the centre of the universe was shown by Tycho Brahe, who, while accepting that Copernicus was right about the other planets orbiting the sun, still made the sun circle the earth. This gave him and his pupil Kepler, appalling headaches. Conceptually our revolution, too, suffers from a kind of Tycho Brahe-ism, an unwillingness to accept fully that not all animals share our point of view. It concerns dominance. When competing over limited resources, one animal in a group tends to gain control, or dominance, more readily than others. In some animals, notably social carnivores and primates, this makes the dominant attractive to subordinates, who approach with cringing gestures and allow their behaviour to be controlled by him. The disobedient go hungry. In others, like horses, whose natural environment does not present competition for food, the reaction to the dominant is avoidance. In times of doubt or external threat, it is not towards the dominant that they turn, but towards a leader whose judgement they trust. They copy the leader’s actions and attitudes voluntarily. Although it has been shown that in horses a) under natural conditions dominance hierarchies are so poorly developed as to be invisible, needing artificially created competition to develop, and b) in partially managed groups, the leader and the dominant are not necessarily the same animal, there is a reluctance on the parts of both trainers and some scientists to aabandon human attitudes about dominance. We live in a highly competitive society, where power hierarchies, status struggles and so on are heavily emphasized. A truly cooperative, non-hierarchical, non-authoritarian social structure is inconceivable to many, although we see it on a smaller scale every day. American ‘natural’ trainers) has pointed out, in a punitive way of using the round pen: the horse is made to gallop about until he submits. I, too, have seen this aggressive attitude in some pupils who have learned from others. The only round pen trainer I know of who differentiates between the roles played by dominant and leader is Mark Rashid, who probably (I am guessing) has not read the scientific literature but is an acute and dispassionate observer. It is a curious state of affairs when those who know that dominant attitudes repel horses fail to grasp its true significance: that horses do not obey dominants. They avoid them. The only direct order one horse gives another is “get out of my space”, which does not help us much. There is no reason to suppose that they understand orders, or obedience, though they do understand pain and discomfort. If, in accordance with equine ethology, we reject the dominance /obedience model, what is the basis for the horse’s apparent obedience? What makes them so compliant? One possibility is that they simply learn, as is assumed in most forms of training. Both practice and theory show that using calm and positive reinforcement makes this process more successful, but these alone do not explain the rapidity of round pen training compared to other forms. Can abandoning the dominance/obedience model open our eyes to other factors, which govern our relationship with the horse? I believe it can, and would like to present some, which have become apparent to me, in the hope that this will stimulate discussion. First, I will assume that you are familiar with the ideas that natural horse/human communication is based on body language, and that a horse seeks confident, trustworthy company when he feels insecure. He then follows this leader, horse or human. But there is more to this than simply following. When a group of horses is attacked, they bunch together and move as one. It is a popular prey move, which confuses the predator’s eye, blurring the outline of the single, vulnerable individual and presenting instead one huge unit, the coordinated herd/flock/shoal/gaggle / or what have you. In the flurried panic of group flight there is no possibility that each member is watching the leader; rather, each subsumes his individuality to the whole, the unitary herd. And this coordination is so fundamental to survival that, like other survival behaviours, horses practise it in play. One of colts’ favourite games is coordinating, in pairs or small groups, practising their intuition of the next move until they behave like well-attuned dancers or synchronised swimmers. They do it with us too, both on an emotional level (calmness, nervousness, playfulness, and so on), and physically. I have seen a colt and a dancer lie down simultaneously, roll, and extend their limbs one by one in perfect harmony, for twenty minutes, and no one, not even the dancer, could tell who was directing the show. They just did it together. Their love of coordination is, I believe, the greatest basis for our ability to manage and ride horses. On one you know well there can be a feeling of almost mystical unity in which the horse seems to divine your thoughts long before you have given any aids. In fact, if you have prepared a youngster well, he does so even on the first occasion of being ridden, moving with extreme sensitivity to indications of which way you are both going next transmitted through your body alone. The ‘aids’ then recover their true meaning: they help clarify the matter when your body moves are not specific enough for the movement you would like the horse to make, or when the horse has momentarily lost the desire, normally so vital to him, to go along comfortably with you in coordinated harmony. Comfort is an important point here. Horses like to be comfortable. The aids are minor irritations that the horse moves to avoid. Some youngsters try to get rid of them in other ways at first, as if they were flies, biting or kicking at your feet, or shaking their heads. However if you keep nagging, without increasing the strength of your signal, and stop immediately only when the desired move is given, the horse rapidly realises which way comfort lies; next time he moves away sooner, before the aid reaches the point of irritating. Effective aids are not only well-timed and well-placed but vibratory. Steady pressures that gradually increase merely provoke the horse to respond with like tension. Lack of tension is crucial to the response of moving away from pressure, for a tense muscle does not yield to pressure: it tenses further. This is not a peculiar characteristic of horses (sorry, Monty), but the result of spinal reflexes that we and other animals also have. The tense horse stiffens against pressure, or even moves into it. When relaxed, he moves away. He does not, as is often thought, have to learn to move away from pressure, as long as you know how, when and where to apply it. The young horse normally appears to do so simply because he loses his tension as the situation loses its unfamiliarity. If he is truly free of tension he responds to the aids perfectly the first time you ride him. Since he is such a great coordinator, any tension on your part will induce tension in his. A further universal concept, it seems to me, is that of blocking. Horses understand the idea of being blocked, either by objects, geographical features, or other animals. Foals block their mothers’ paths when they want to feed; a jealous mare blocks another from reaching the stallion; horses block us from reaching the manger with the bucket. Blocking moves are used in play, as we use them in the round pen to turn a horse. The block says ‘not that way’. We know that horses naturally hate the feeling of being restrained, caught in ropes, or held tight. In our anxieties about control we give ourselves problems by doing just that. Understanding the block sheds a different light on what a lead rope does: it reminds the horse not to go away or eat grass when other interests overcome that of coordinating with you. For the rest of the time you do not need it. Similarly the reins are not a means of control by constant pressure, but rather a channel of communication through which you coordinate your hand with the horse’s head, occasionally blocking his movement by stopping your hand. A wilful horse is better retrained by blocking his unwanted moves, waiting until he has accepted the block, then asking him politely to go in your direction, than by trying to wrench him round when he is bent on another. Coordination, comfort, the understanding of blocks and body language: these seem to me the factors influencing most of our interactions with the horse, a kind of first stab at Newtonian laws of horsemanship. They are set in motion by the horse’s love not only of movement itself but of solving problems successfully, which to him means emerging comfortable and safe. Like us, he delights in testing his knowledge in guided experimentation rather than in drill and forced rote learning. To these principles we must add a proper understanding of how muscles, bodies and balance function if we are to work well together. Although this analysis is at present tentative, I have been greatly encouraged both by its simplicity (natural laws tend to be few and simple: it’s their interactions that give rise to complexity and variability) and by the rapidity and comprehension with which people learn when taught through these principles. True natural horsemanship, then, is not a scheme of teaching, however well constructed, but rather a dedication to the analysis of natural horse behaviour and its application in horse/human interactions. It is difficult, against the weight of tradition and the hierarchical nature of our society, to discard a fundamentally human point of view, just as it is difficult to feel the earth spinning and orbiting. The sun rises, doesn’t it? But the subtler analysis remains truer to the facts. We do not have to discard the hard-won knowledge of the past, the understanding of movement and balance, the progression of certain exercises towards certain ends, the manner in which to teach successfully. These are still as valid as the ancients’ observations of planetary movements. But the theoretical framework in which they were embedded has always given trouble to those of us who lack that magical intuition possessed by a gifted few, or years of dedicated experience, for the simple reason that it is flawed. I may not have it quite right, but it is surely time that we thought about it!